With my daughter living abroad, I am constantly asked, “What are you doing for Mother’s Day and will you see your daughter?” Every time I hear that question, I feel a sense of gratitude and gain a huge smile on my face. To me (and fortunately to my daughter), every day we spend together is a celebration of some type: Friendship, Birthdays, Valentine’s Day, Mother’s Day or any other holiday or reason. Regardless, in my heart it’s a CELEBRATION of love and gratitude (and not one of loss or lack). This Sunday, many countries around the world will celebrate Mother’s Day. It’s only natural to wonder how this great tradition of honoring mothers throughout the world evolved. Mother’s Day can be traced to the late 19th century in the U.K. and the United States; however, the origins of the famous holiday go back to ancient Greece. Ancient Greeks held an annual spring festival in honor of the mythological maternal goddesses and used this occasion to honor Rhea, the Titan daughter of the earth goddess Gaia and the sky god Uranus. And later, Early Christians began to celebrate Mother’s Day on the fourth Sunday of Lent in honor of the Virgin Mary, the Mother of Christ. I have traveled to Greece many times, and each trip fills my heart and senses to overload! Colors, light, textures, vistas, history, and water inspire me. I love my job as an artist and the opportunity to travel for subject matter as well as sharing time with family, friends and galleries along the way. 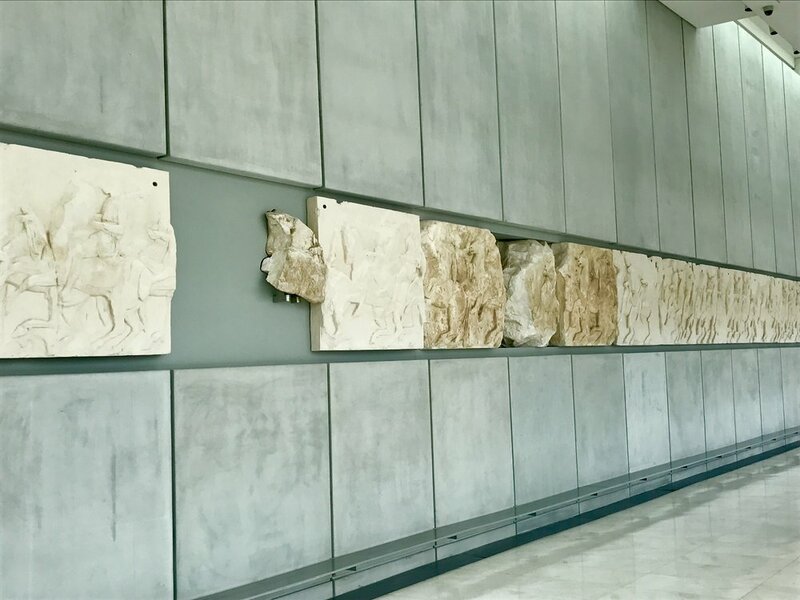 One of the many highlights from this recent trip was a visit and private tour of the Acropolis Museum in Athens, Greece. The museum is absolutely amazing with it’s contemporary design of glass, metal and concrete housing national treasures from around the 5th century BC forward. The role of light in this building is wonderful! As an artist, it is important to understand how light changes throughout the day; such as, the intensity, the quality and the relationship light has on its subject matter (i.e., friezes, statues, columns and relics on display). The architect’s attention to this is obvious through the manipulation of natural light via the placement of glass walls and skylights. As the light changes throughout the day, the antiquities seem to come to life as the light moves across them. 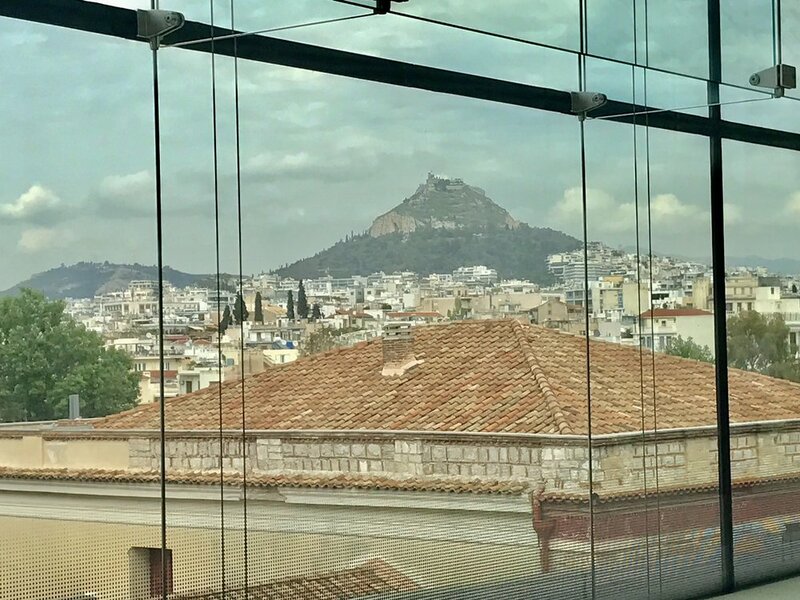 The incredible vistas of the Acropolis, and Lycabettus Hill can be seen through glass walled museum, as well as the views one enjoys of archeological digs which unearthed ancient cities while walking on the glass floors. 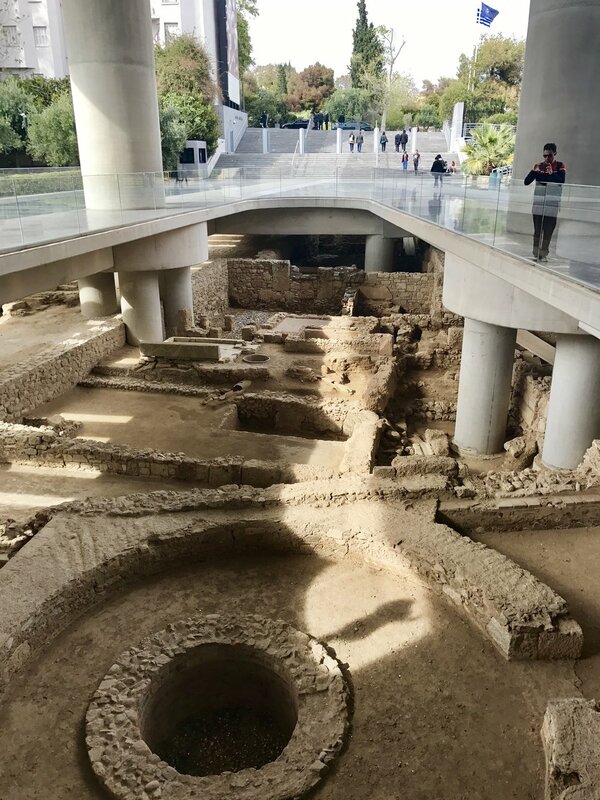 I am grateful for the opportunity to learn more about the history and heritage surrounding the Acropolis and to absorb the colorful stories, statues and plans of the Acropolis Museum. What a treasure! Wishing you all Happy Mother’s Day. I am blessed to be surrounded by love, and I am committed to share this tradition with others! While in Greece, I painted and have continued to work on these inspirations once I returned. They are in progress and I will post when they’re finished. Here are some photos from my recent travels to Greece. Please ENJOY! !